The premier main home is exquisite with a regal foyer that instantly mesmerizes you as you enter the main level adorned with imported marble floors and gorgeous imported area rugs though out. The double A frame chalet construction brings the outdoors in with all the natural lighting and shows off the beauty of the spectacular view, the infinity pool area and private setting of the 185 Acre West Viginia property. Consisting of 10,931 Sq. ft. you could not find a more beautiful premier property was built with all the love and attention as this private resort. The possibilities are endless.use as a private luxury home, B & B, healing/rehabilitaion retreat, corporate event center, destination wedding resort, equine retreat/training center, spritual retreat, or a spa resort. With 28 rooms this luxury West Virginia home has everything you could ever dream of.offering an exquisite foyer, 5 fireplaces, 2 gourmet kitchens, owner suite and bath for a total of 9 bedrooms, 7 full baths, 3-1/2 baths, great room, family room, formal dining room, sun room, additional living suite, bonus room, family media room, library, study, loft, office, sauna, recreational room, gym, 3 laundry facilities, utility room, elevator, 5 car attached heated garage, In ground infinity pool, several tiered decks, enclosed patio, barn/stable, riding arena, and a beautiful pond with a large sundeck, dock and tree house/hunters stand. 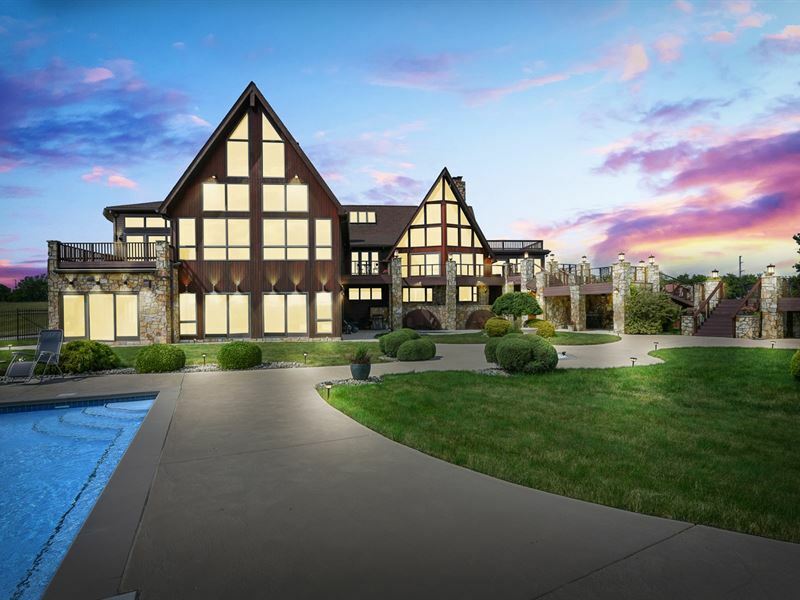 Designed for entertaining this entire magnificent luxury home has comfortably hosted several events with over 250 guests for weddings and several other social events. The large acreage also offers a hunting outdoor paradise with an abundance of wildlife everywhere and would be the perfect place for a healing/rehabilitation center or for many other commercial possibilities as well. Price includes several pieces of equipment to maintain the premises and several home furnishings in the main home are negotiable too. The beautiful West Virginia guest home is a 2 story farmhouse with 7 rooms, 4 bedrooms, 2 full and 1-1/2 baths with a total of 2328 sq ft. of living space and a 4 car attached garage. The home offers a huge living room, kitchen & dining room/family room. Located in Marshall and Ohio Counties in Wild, Wonderful, West Virginia only 10 minutes to Wheeling, 50 minutes to Pittsburgh/Airport, 5 minutes to Interstate 70 and 15 minutes to Cabela's.Please visit to view the beautiful drone video and 3D interior tour of this magnificent estate.